Jordan Mills has been an example of consistency, as he’s played over 1,000 snaps in each of the past three seasons, making him one of only seven tackles to do so. He is still only 28 years old, but he has never surpassed his career-high 62.7 overall grade, which came in his final season with the Chicago Bears. At this point in his career, Mills has proven that he can be a stable backup offensive lineman in this league but not a quality starter for a team. 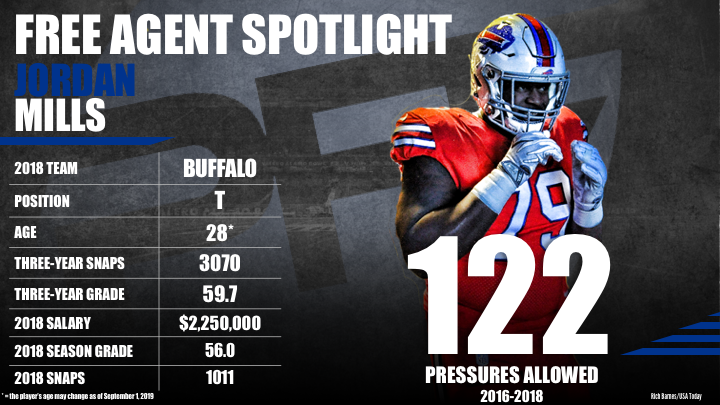 Since 2016, Mills has led the Buffalo Bills in total pressures allowed and has posted the lowest pass-blocking grade among the team’s qualifying offensive lineman. The ceiling hasn’t been very high for Mills thus far in his career, only earning a game grade above 80.0 just once since entering the league in 2013 (Week 13 vs. DAL, 83.9). However, Mills’ strengths have changed since coming to Buffalo from Chicago. After earning a higher run-blocking grade than pass-blocking grade each of the two seasons in the windy city, Mills has improved his pass blocking while his run blocking has taken a dip. His 47.7 run-blocking grade in 2018 ranked 77th out of 85 qualifying tackles. Subscribe to Pro Football Focus’ ELITE subscription to research Jordan Mills’ grades, advanced stats, snaps and more in Premium Stats 2.0.